Renovation of a home is not a piece of cake. It involves a lot of hard work, creativity and organization skills. Once done, it is not something that can be turned around, so it is essential to monitor the work and also, ensure you have enough control over the process to avoid making any significant mistakes in the process. You will require the services of experienced painters, roofers, electricians and plumbers. It is better to opt for a cabinet makeover, rather than complete replacement. This idea supports both, your budget and your creative mind. In doing so, you must ensure you only work with experts in the job as you need to receive value for money. 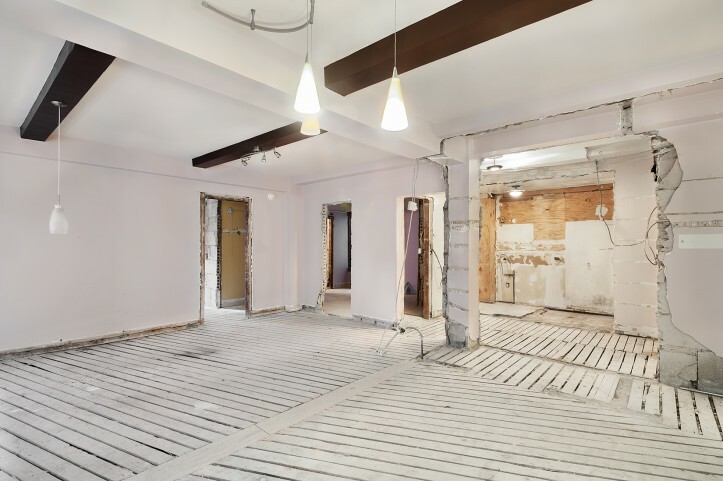 If you’re someone who hates congestion and is looking to create as much space as possible through renovation, you must look at opening up your home by connecting areas together. Also, consider using artificial walls that will prove easy to collapse and remodel as when required. When you’re midway a renovation project, access to your kitchen is almost forbidden, and this can be a nightmare for many. A solution to this could be creating a light cooking space in a part of the house that’s not affected by the whole process and add in some basic kitchen essentials, such as a microwave oven, toaster, and an electric skillet, etc. The perfect lighting adds soul to your otherwise dull interiors. Keeping lighting considerations in mind during a renovation is essential. Many a time, the right light even makes spaces look more significant than they actually are and also, enhances colours and details of the decor. Ask your electrician for advice and you lighting installation needs. Fancy materials are showstoppers, but not everyone can afford the luxury of Marble countertops and Brazilian Walnut floors. So keep in mind to invest only in materials that are moderate in cost and also are value for money. Looks for options where you can save money, for example old and dirty concrete can be improved with pressure cleaning and then painted to look like new. Remember never to opt for cheap contractors to cut costs. A pricey contractor is any day better than a poorly remodeled home. Always ask to view work samples of contractors before zeroing in on one. If your pockets are tight, get pre-approved for additional funding. There are varied funding options available in the market so make sure you do your research before jumping into the project. It’s always best to conduct an overall check of the stability and safety of the house before you go all out and remodel the whole set up. It’s vital to ensure that you have a safe space that will hold up well to all the changes you’re planning.